One day back in 2006, Diane Shink dropped in for a visit on her way back from P.E.I. She had been to the Quilt Gallery in O'Leary and spotted their newly arrived "Red Haired Anne" fabrics. 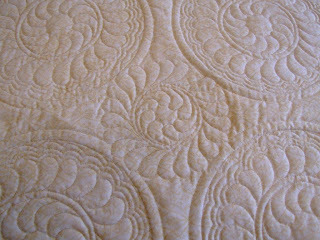 Diane left me with four Fat Quarters and suggested that perhaps I should design a quilt to go with them, as the fabric line had no patterns. I laughed and said "no thanks" as at that time I was up to my elbows in magazine work and not wanting to take on anything more. Diane hadn't reached River John by the time I had sketched my design on the computer and called The Quilt Gallery for more fabric! Here's what I came up with. I named the quilt Anticipation. The inspiration was of course Anne's iconic straw hat and red braids. My first version of the quilt was pieced using just the Red Haired Anne line, but I stitched it again using a Maywood Studio print featuring a bed of wildflowers for the golden background. As if designing a pattern isn't complicated enough with getting it tested, copyrighted, printed and packaged this one had the added red tape of needing approval from the Anne of Green Gables Licensing Authority. Everything to do with Anne is heavily regulated (rightly so) and the quilt needed a nod from the board before the patterns could be sold. As a lifelong Anne fan, it was a huge thrill to speak with Lucy Maud's granddaughter, who loved the quilt and gave her blessing for the license. The pattern was popular but it turned out to be a lot of bookkeeping and expense, as in addition to the licence fee there were also royalties to submit. When the pattern run sold out, I did not reprint. It was a real treat to receive this picture yesterday from Val of Maple Leaf Quilters. She has added her own very special touches, making an already feminine design even more so. I love the treatment of the hat, with the appliquéd flowers and the lace edging on the brim. Val has also cleverly fringed the ends of the braids and left them hanging free. Sweet! You can read more on the construction of Val's quilt here. 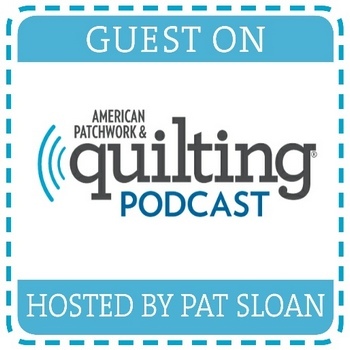 One of the interesting things is that although we think of the Anne series as being for the younger set, Val's quilt will be a gift to an adult friend who grew up loving the Anne books. 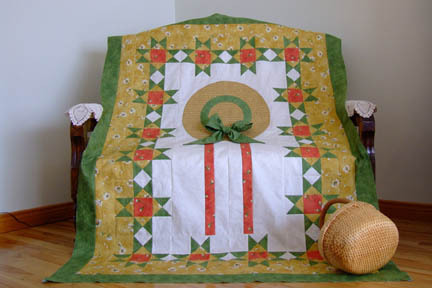 My green and gold version of the quilt shown above was commissioned by a woman for her sister in Australia undergoing chemo treatments. They hadn't seen each other in years, but she remembered the bond they had growing up and reading the Anne books and knew that it would bring comfort. The bond of kindred spirits never wanes, I guess. A very sincere thank you, Val; I hope your friend loves it. I know I do. 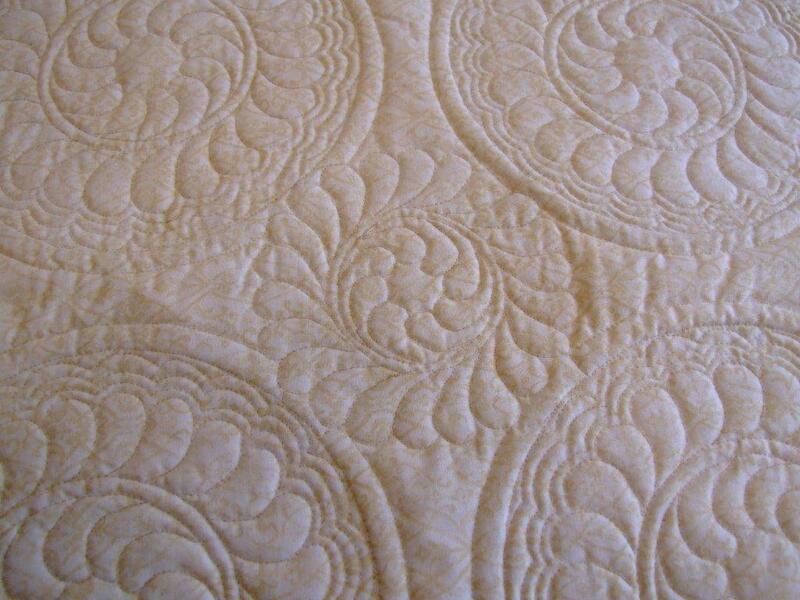 Here's a lovely finished NY Roundabout Again from "Shepody's Quilter" Marjorie in New Brunswick. She and two pals, Connie and Marla, each made their own version. You can see more pictures on Marjorie's blog, which is aptly named Marjorie's Busy Corner; you will see she keeps her machine up and running at all times! Thanks for sharing Marjorie, and for the beautiful work you did. The pattern for NY Roundabout Again is available on the checkout page of my website. As I've shown before, the queens arrive in individual cages with a few attendants in each cage to make sure she is kept fed and happy on the flight. The queens come from Hawaii and I always figure it's a brutal shock to their systems to suddenly wake up and find themselves in Nova Scotia. As beautiful as it is here, our climate is quite different than these ladies are used to. It was around 13° C yesterday as we worked; what was it like in Maui, Mark? I didn't take a picture, but stamped on the bottom of the cage was the word Kona, which of course made me think of Kona cotton and Kona Bay fabrics. Sometimes it's hard to leave the quilting behind even in the beeyard! Hubby puts cage and all right into the hive. The worker bees will chew through the sugar plugs at each end of the cage to release their new queen. I've written more in this post, so you can read back if you are interested. Basically, you split the over-full hives into two leaving the old queen in one and adding the new queen to the other. Problem is, you have to go through all the frames to find the queen to make sure you have one in each colony. It's no small job to scan for the queen. It's hours of work sometimes, just to do a few hives. If you don't find her the first time through, you have to go back over the frames again and again until you spot her. She moves very quickly so it's a tricky process. We feel relieved each time we spot a queen in a hive. Can you see her here? By last evening, we had found and placed all the queens and then proceeded to move the first group of hives to a blueberry field. We had gone out early in the day to put in the bee escapes and secure the inner covers with nails. I'm amazed there are so many blossoms out in all this rain. The other fields where the bees go are a bit behind this one, so no doubt they will travel out next weekend. Here's hoping the sun finds us for the next move. 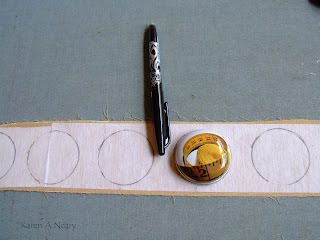 Check out the next stop on the Mirror Ball Dot blog hop. Dory, from Worthy Goods Textile has stitched up a charming project which I am sure you will love. Don't forget to leave Dory a comment to win some of this fab fabric for yourself. If you are joining us mid-hop, here's the list of all participants and dates of project posting. Yay - the schedule for the 6th annual Nova Scotia Fibrearts Festival is up on the website! Check it out to see the listing of workshops and events planned for this spectacular week in October. 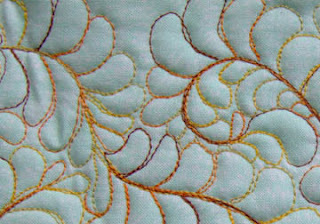 This year I will be teaching one day workshops on beginner feather quilting. 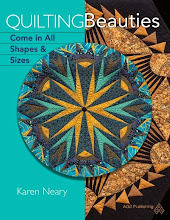 If this is something you've been longing to try but need a little boost in the bravery department, then come join me for a day of instruction and encouragement in the fine art of feather quilting. ...repeated and repeated for one glorious result! ...and as an overall background pattern. You will be amazed at what you can do! Cost for Beginning Feathers is $65.00 tax included ($56.52 + $8.48 HST) This one day workshop will be offered TWICE during the 2013 Nova Scotia Fibre Arts Festival: Friday Oct 18th and Sat. Oct. 19th. from 9 am -3 pm If you would like to register for this class, please email and I will add your name to the list. If free motion feathers are not your thing, there is lots more to choose from at this year's Festival, so make sure you click 2013 Schedule at the top of this page to see all of the offerings! "Facing Appliqué": doesn't that sound ominous?...like facing a firing squad, an angry boss, or something equally unpleasant. 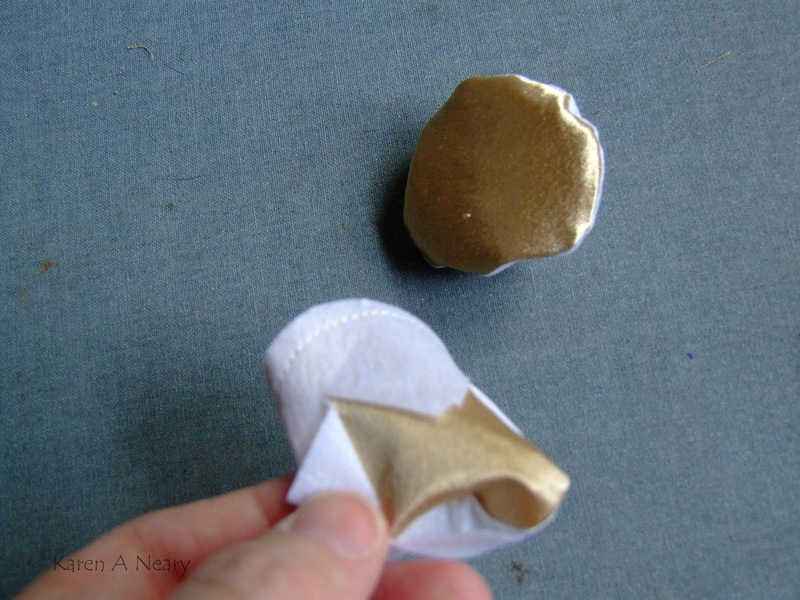 In truth, it's a really simple way to turn under the edges of appliqué pieces, and especially useful when working with specialty fabrics such as silk or satin. 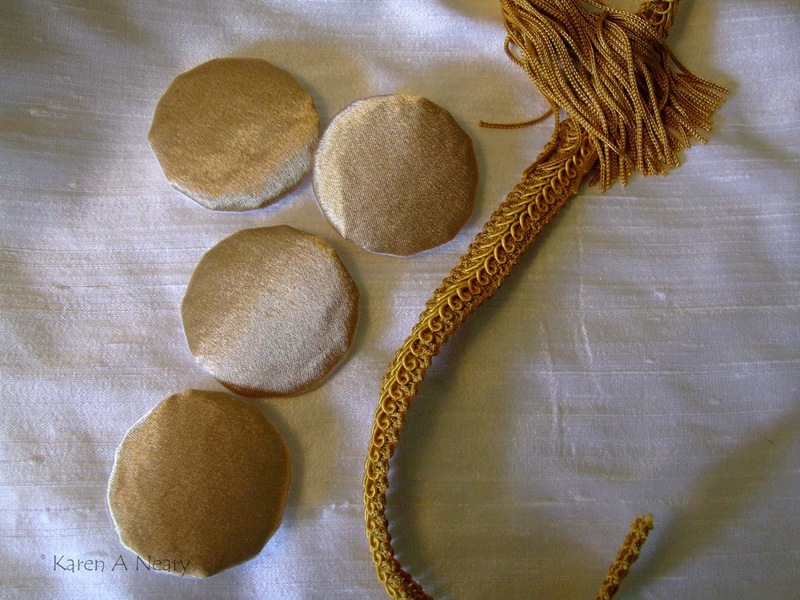 While my Father's Day antependium perks away over on one wall and my selvedge tote languishes on the table, I've started in on the communion hanging. 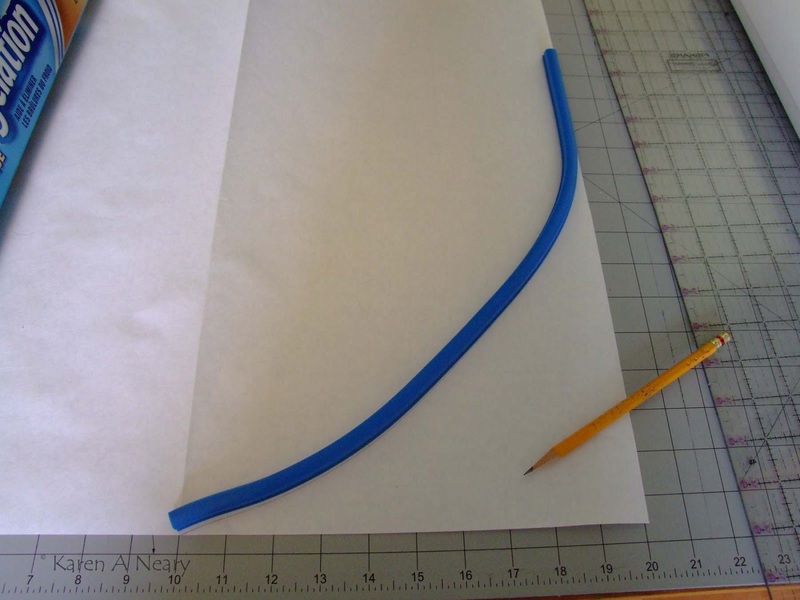 Using a flexible ruler, I traced a gentle shape that will resemble an heraldic shield. The background fabric is a pure white dupioni silk, and I am envisioning grapes and wheat sheaves on the front. As much as I am aware that this church likes lots of bright colour, my heart is leaning towards a monochromatic palette - gold on white. The elements will be representative rather than realistic. A second layer of interfacing was placed right sides together with the front side of the satin. 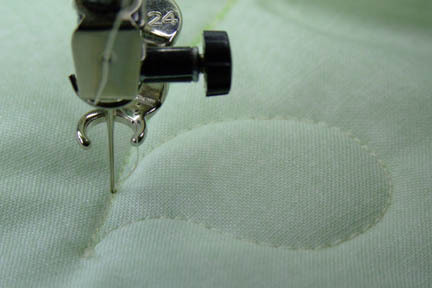 In this case, the right side of the interfacing is the bumpy, fusible side. 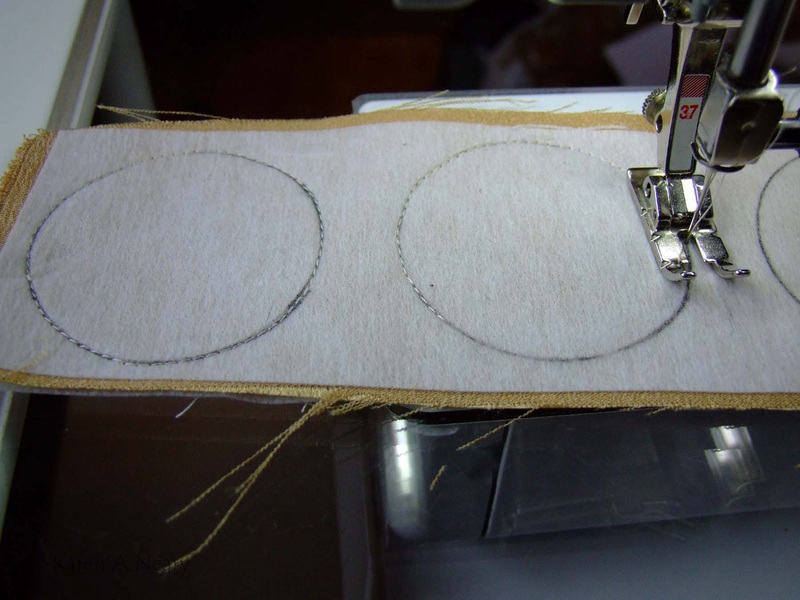 I sewed completely around each circle. Then I cut them out, leaving a scant 1/4" seam allowance around the outer edge. ...and birthed the fabric to the right side out through the opening. Doing it this way puts the fusible side of the interfacing facing out on the back. With a press cloth, I can fuse these grapes in place temporarily. 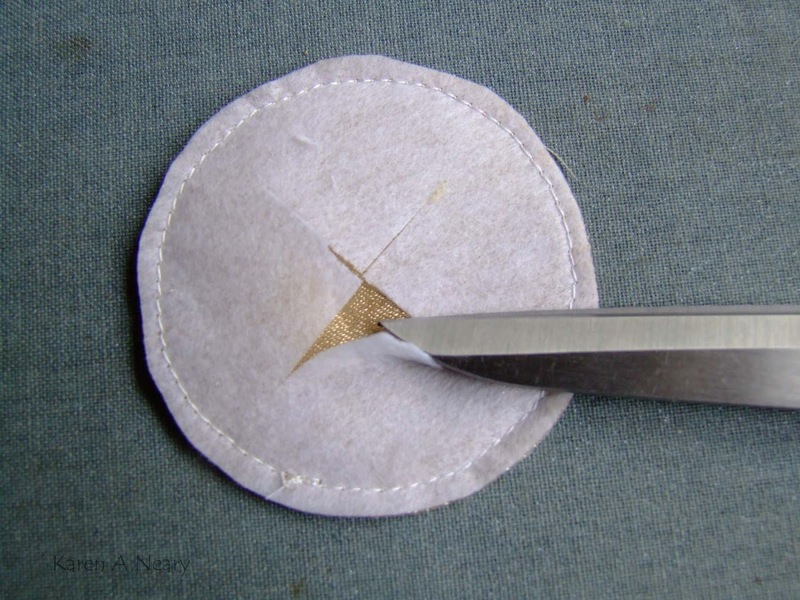 The interfacing does not adhere as firmly as fusible web, but just enough to hold the piece in place while you stitch around the edges. It saves pinning or basting, and I want as few pin holes as possible in the fabric. Now on to the wheat...which will take some thinking. I am down to the last two commissioned liturgical paraments, and the next up is Father's Day. I find the hangings which are not for actual "church days" to be more of a challenge to get my head around but I like the design I've come up with for this one. As with most of the others, I chose to use silk. After much thought, I started stitching to see if the idea looked as good in fabric as it did on paper. I really like how this blue goes with the rich green dupioni. Father's Day falls in the season of Ordinary Time, which is green. Before it's done, there will also be bits of white and red in there as well. It looks a little lumpy in this photo but it will flatten with a good press. 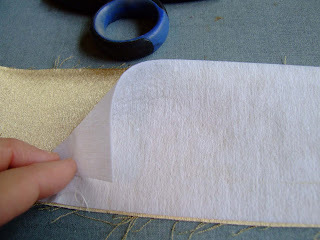 Working with silk is very different than cotton and I try to press as little as possible, and always with a press cloth. Direct heat is not a good thing. My method is to sew a bit and then walk around it for a few days to see what changes are needed. In the meantime, I need something mindless to keep my hands busy while my brain is still engaged with the antependium. My bag of selvedges has grown quite full so I decided to sew some blocks. ...so quickly in fact that I have finished enough for a new tote. My original one has been kicking around since 2009 and has quite a few miles on it now. It can use replacing. This is a post for all the cat lovers out there, pictures of Polly and Maddie being cute. I've shown this first picture before. It's Polly when she was very young, snuggling with the stuffed cat (named Catee) on the back of the couch. Each time Polly had a nap attack, she would seek out Catee to curl up with. We eventually moved Catee to our bed and Polly continues to seek her company. We looked around to find a soft stuffed cat for Maddie and found one just before Christmas.This tuxedo Jelly Belly was perfect, and unbelievably soft...like Maddie. The stuffed cat got named Charlie. Maddie took to him right away; maybe he figures it is his long lost brother? Fast forward to a couple of weeks ago and here's Maddie curled up for a nap with Charlie. Polly arrived in the same spot for her afternoon siesta. Between the pair, they have almost as many stuffed toys as our two boys did...and play with them way more. Whoever coined the term "Fur-babies" got it right. Thank you to all who left comments on the Mirror Ball Dot post. To select the winner, we used the high tech method of printing the names and putting them in a bowl. Polly and hubby closed their eyes and chose this one, from Grandma Coco! Grandma Coco, if you will kindly send us your mailing address, I will forward it to Mark for your prize of 5 Fat Quarters and a Mirror Ball Dot colour card. In your usual style, I know you will do something amazing with it! 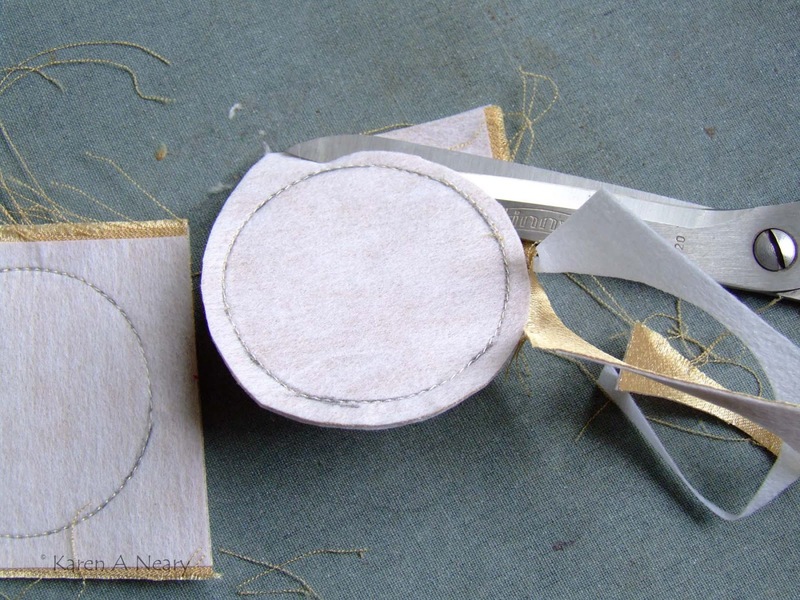 The next participant in the hop is Elisa Albury; you can read Mark's intro here and see Elisa's gorgeous project on her blog, Stitch Outside The Ditch. Below is the complete schedule of the Blog Hop so you can check back on what's been posted so far and watch for what's coming. 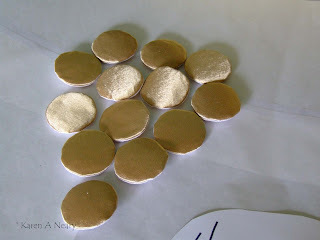 Congrats to Grandma CoCo and thanks to all for your lovely comments and participation in the blog hop. It was fun for sure! Don't forget that my draw for Mark Hordyszynski's Mirror Ball Dot fabric ends at midnight AT (Atlantic Time) tomorrow May 18. All you need to do is leave a comment on the project post for a chance to win a colour card and 5 Fat Quarters of Mirror Ball Dot. Good luck! Edit: Linda was the winner of the first draw on Mark's post and her goodies arrived today. Check out what she received! 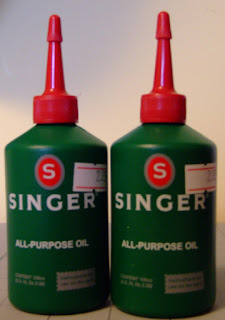 I was immediately drawn to them for their nostalgic appearance: they look like they belong in a Featherweight case...and what a bargain for $2.95. 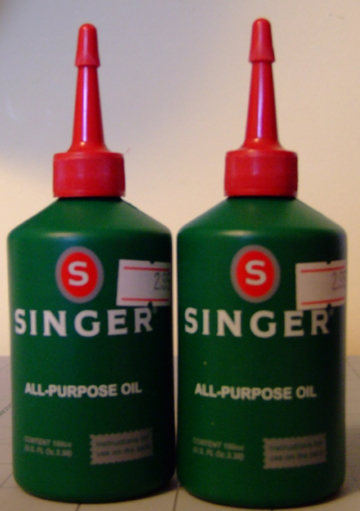 Purpose Of The Product: Protect and lubricate sewing machines, door hinges, bycicles, motors and appliances in general. Caution: To hold the children and animals out of range. In case of ingestion to take contact with the medical services. 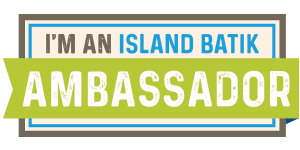 Cares With the Environment: Never throw on the public way, in the rivers, lakes and oceans. Never reuse the empty packing. Validity perms if the product is kept in cool and dry place. Reaching my hand into the mailbox is a favourite part of my day; you never know what surprises you may pull out. Perhaps it's because I grew up at a rural Post Office, but the fascination with mail never grows old. Imagine my delight when I reached in and retrieved this fabulous fabric postcard from Kate in Ontario. 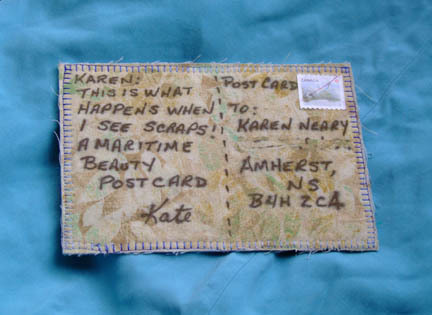 Kate has recently completed a Maritime Beauty and she used her scraps to send a greeting. You can check out her post here. I love her title ("Maritime Cutie") almost as much as I love the postcard! Thanks so much, Kate. I imagine my mailman was intrigued by this unusual item in his mailbag. One Maritime Beauty I have been anticipating seeing is Jennifer'shttp://bronzewombat.blogspot.ca, from Bronze Wombat fame. Hailing from Australia, Jennifer purchased fabrics for her project on trip to Canada last fall and sought to make this a reminder of her visit. Most were purchased in Victoria, B.C. and she chose colours to represent sea, sand, rocks and sky - things which impressed her as being very "Canadian". 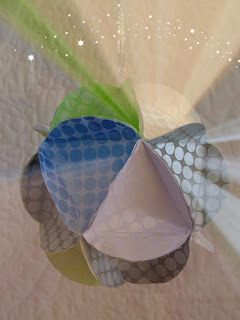 With permission, I nabbed this shot of her fabrics from her blog, but please visit to see her pieced top: it sparkles! Thanks to both Kate and Jennifer for great work.